SPILLTRATION™ Husky oil and fuel absorbent rug. 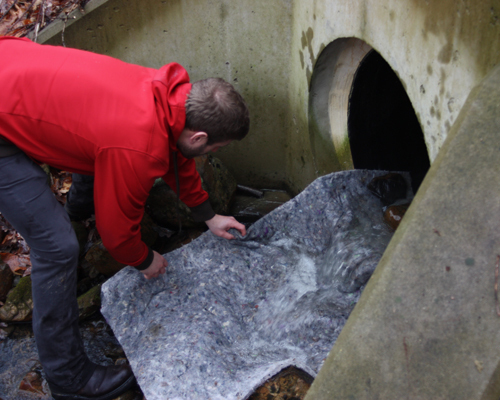 Husky Rugs cover larger land-based oil spill areas quickly. 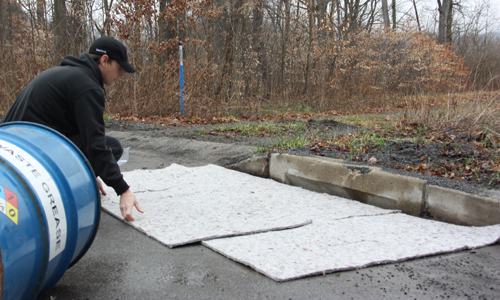 SPILLTRATION™ Husky Rugs are perfect for covering larger land-based oil spill areas quickly. Each Rug measures 32″ wide x 48″ long x 1/2″ thick. Whether you need to cover storm drains; protect runoff ditches & stream banks; catch oil from water at culvert outfalls; or absorb larger oil spills on wet parking lots or roadways, SPILLTRATION™ Rugs are a valuable oil spill cleanup weapon in your arsenal. Get to spills fast with SPILLTRATION™ Cubby kits. Just grab and go. SPILLTRATION™ Cubby Kit was named because it fits in the tightest nooks, crannies and cubbyholes. It’s smoosh-packed to fit in an area 80% smaller than the traditional 9-gallon spill duffels sold by the competition. Like all Spilltration products, the Cubby Kit is designed for the outdoors to absorb oils and fuels while allowing clean water to filter through. . The SPILLTRATION™ Husky Rugs for oil and fuel spills are engineered to work differently than traditional oil-only spill products. 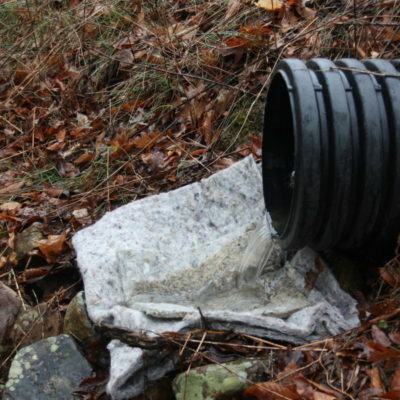 NOTE: SPILLTRATION™ products are engineered to remove oils from rain and run-off water in land-based applications. Although, they are also great at plucking oil from the surfaces of ponds, lakes and streams, SPILLTRATION™ products do not float and will sink beneath the water’s surface quickly. REUSE: SPILLTRATION™ Rugs can be wrung out and used over at least 10 times…reducing materials and disposal costs. 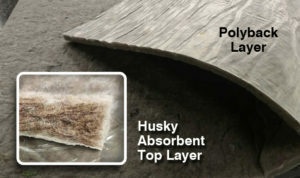 Husky Polyback Rugs laminated bottom layer prevents oil from leaking through. A better way to contain and absorb transformer oil leaks, especially in wet weather. SPILLTRATION™ Husky Polyback Rugs with laminated plastic backing are engineered to absorb oils in the outdoors… rain or shine. Spilltration® fibers on PolyBacked Husky Rug absorb oil and filter water. 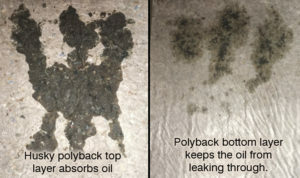 PolyBacking prevents oil from leaking through. Traditional white pads are thin and only absorb small amounts of leaky transformer oil. 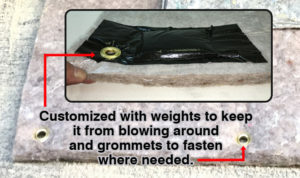 Spilltration Husky Rugs are laminated with a sturdy plastic backing to prevent oil from leaking through. Best of all the Spilltration Rugs allow rain water to filter through. Oil Sticks. Water Wicks. (center photo left) Top side of Spilltration 32” x 48” Husky Rug. Note how the oil leaks “spread out” and are absorbed into the Spilltration fibers. Bottom side of Husky Rug plastic backing prevents oil from leaking through. 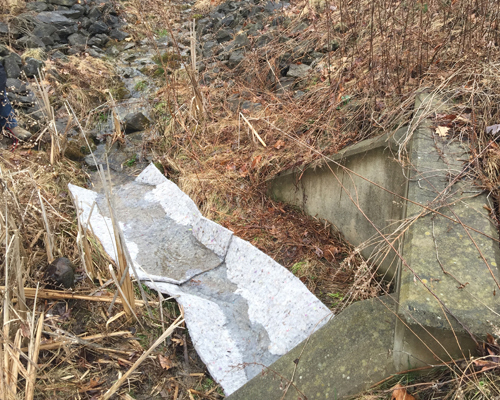 Rug absorbs over 3 gallons of transformer oil and still allows clean rainwater to filter through.